Warm herb infused oil soothes your senses as it flows across your forehead from temple to temple before settling on the third eye point. The treatment is concluded with a head massage. The treatment lasts 45-60 minutes. Results are a calm mind and deep relaxation. Shirodhara uses organic herbs and oils which are mixed for your individual Dosha (body type and condition). Treatments may be therapeutic in nature, or combined with massage or other spa treatments. 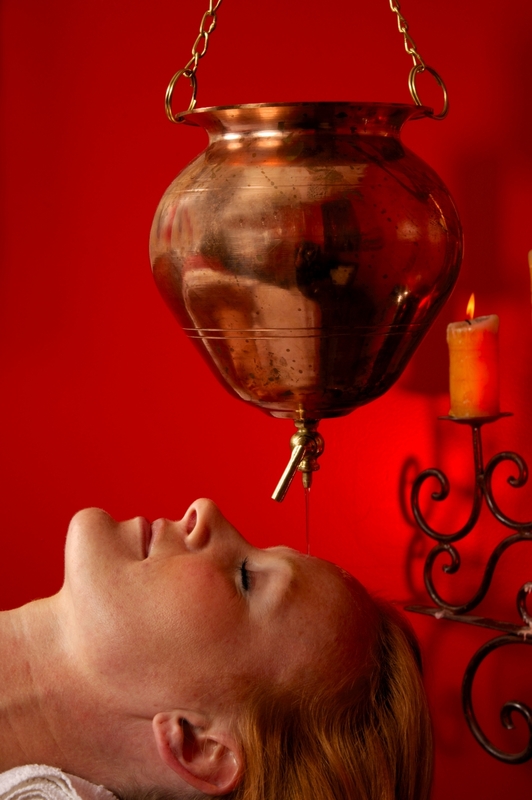 Shirodhara treats migraines, insomnia, stress, restless mind, and can be enjoyed as a spa service for relaxation. Abhyanga massage emerged from the Ayurvedic tradition, an ancient Hindu system of holistic health and medicine. Abhyanga, meaning “Loving Hands,” is practiced with the use of one or two therapists using a technique called mirror massage, (similar to tandem massage). The massage utilizes synchronized movements on either side of the body, bringing balance to the left and right hemispheres of the brain, while working long marma points which are similar and often the same as acupuncture points used to balance the body and remove toxins from the system. October 12th-14th Envision Personalized Health is hosting a 18 CEU workshop for Massage Therapist , Acupuncturist, Estheticians, and other professional health care providers. Melanie and Robert Sachs from Diamond Way Ayurveda will be our educators for the event. You will learn the two most popular treatments in Ayurveda. Treatments can be tailored to the individual and be customized to be given as either a therapeutic treatment or as a relaxing spa treatment. Workshop is limited to 10 students to ensure a comprehensive hands on learning experience, so register early to save your space in this exciting 2 day class. Please pass this along if you know a therapist who would be interested in attending.